In this series of posts we will be creating InfoPath form instance (XML) documents programmatically using the SharePoint object model. In contrast to other articles about this subject, we will extract the goo required directly from the InfoPath form XSN file itself, the correct InfoPath XSN file will be determined by the Content Type associated with the form. So what goo do we need to create an InfoPath instance document? The forms (default) template XML, this an XML document whose structure is inferred by the form schema. Used by SharePoint to determine the content type associated with the InfoPath form, as I discussed in this post. Used by InfoPath to determine among other things the form (schema) version and InfoPath client version. How do we get the goo? The files of interest here are template.xml, which contains a template XML file, and manifest.xsf, which is an XML file containing all the forms metadata. 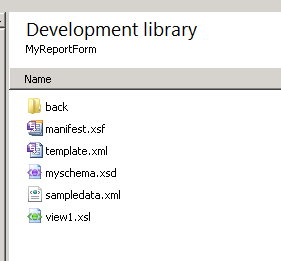 We can also see the form schema file (.xsd), the sample data file and the XSLT transformations (.xsl) which create the forms Views. Extracting Files from an InfoPath Form XSN File. For the template xml we can just extract the template.xml file and use it straight off as it is. InfoPath Form XML Processing Instructions? The sharp-eyed amongst you may have noticed the href attribute in the mso-infoPathSolution PI….where’s this from I hear you ask? This attribute is a key component used by SharePoint in determining what the forms associated content type is, as I discussed in this post. 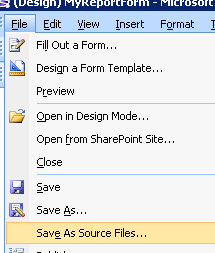 Remember that for the most part InfoPath forms are deployed into SharePoint as content types. So the href attribute value, needs to be set to the document template URL of the InfoPath forms content type, which is accessible using the SPContentType.DocumentTemplateUrl property. In part2 I’ll show the components of a function which creates an InfoPath form instance document using a Content Type name (or ID) and the XML form body (based on the template XML of course). Taking the assembled piece of XML, it’s then an simple matter to publish this into a document or form library. If I have xml infopath files that have been generated by code rather than by the infopath form itself (using the method you mention above to generate the .VBS file), how do I go about correcting the namespace issues so that I can automatically extract the metadata when the form(xml) is uploaded to the forms library using the same .XSN file as the template? Michael, not sure if I understand you correctly, but the XML form instance document should be a fully qualified XML instance document. In InfoPath terms, the document elements should all be namespace prefixed (e.g. ) with the namespace URI / Prefix being declared, probably on the root document element. If you create the form instance document correctly, your promoted property columns in SharePoint will work as expected and show the form data in the SharePoint columns. Is there a way that I can find out the name or guid of library on sharepoint site where I am creating a xml document from an InfoPath content type? When I publish a InfoPath template to a library that document has in its processing instructions the href which gives me the library where published, but when I publish it as content type on a site, and use it in multiple librariers in href I have a folder url where I saved content type. I need guid or href of library where I opened and am to save the xml document based on InfoPath content type. And this infopath content type is client based, not browser-enabled. I need to programmatically load a infopath 2010 form submitted to Sharepoint 2010 and then convert those infopath forms to PDF document. Could you point me in the right direction. 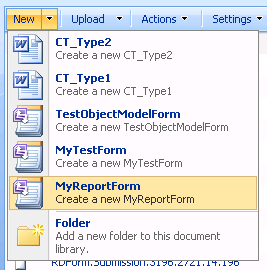 I’m looking at Infopath Forms Services object model to accomplish this task. Could you please point me in the right direction. Reblogged this on SharePoint Blog. Previous Previous post: SharePoint: EncodedAbsUrl and the Full URL of an SPListItem.